Kami Glass loves someone she's never met... a boy she's talked to in her head ever since she was born. She wasn't silent about her imaginary friend during her childhood, and is thus a bit of an outsider in her sleepy English town of Sorry-in-the-Vale. Still, Kami hasn't suffered too much from not fitting in. She has a best friend, runs the school newspaper, and is only occasionally caught talking to herself. Her life is in order, just the way she likes it, despite the voice in her head. The Lynburn family has owned the spectacular and sinister manor that overlooks Sorry-in-the-Vale for centuries. The mysterious twin sisters who abandoned their ancestral home a generation ago are back, along with their teenage sons, Jared and Ash, one of whom is eerily familiar to Kami. Kami is not one to shy away from the unknown - in fact, she's determined to find answers for all the questions Sorry-in-the-Vale is suddenly posing. Who is responsible for the bloody deeds in the depths of the woods? What is her own mother hiding? And now that her imaginary friend has become a real boy, does she still love him? Does she hate him? Can she trust him? Wow! I seriously am in love with this novel AND with Sarah Rees Brennan!! This book completely blew my mind! I cannot wait to get my hands on the second book. The cliff hanger is huge and I am dying to know what is going to happen. First of all lets just all take a second to stare at that cover. Breath taking right? I am in cover love with it. 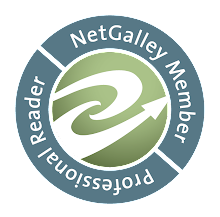 That was part of the reason I requested it from NetGalley. I am pretty sure it was on someone's waiting on Wednesday maybe and then I somehow started following Sarah Rees Brennan and her twitter image is this cover and I found myself mesmerized by it every time she tweeted so I had to get it. Then I saw it on NetGalley and read the blurb which made it even better, because it sounded like such an interesting read so i requested it and GOT IT! I am so happy I did, because this was an AMAZING read! I honestly cannot get over how much I loved Unspoken! I am going out and buying a copy today (since it just came out!!). 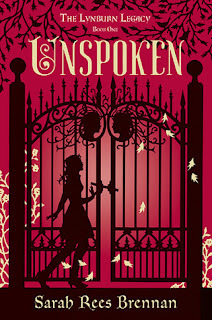 Unspoken is unlike any other book I have read before. I fell completely head over heels with Kami's character and I love all her friends characters as well... and every other character that was introduced. Seriously Sarah did an amazing job with character development. I also have never read a book about someone hearing a voice in their head all their lives and then that voice ending up belonging to a real person. So weird. I really want to know where Sarah's inspiration was for this story. Lets talk about the characters. Like I already said I loved every single one of them. They were so well developed and all had their own personalities and voices. It was very clear who was talking at all times. Kami was by far my favorite, though. She was hilarious! I don't recall ever laughing so much during a book. She just has that easy going personality about her and makes all these jokes all the time. This novel put me in such a good mood. I wanted to read just to laugh and be happy. I will give you a little SPOILER, nothing that would ruin the story though so don't be scared to read the next line. The ending was not happy, it was the exact opposite of happy. That is the "little" spoiler. END OF SMALL SPOILER. I am going to break out of "review mode" and tell a little personal story. It has to do with the book, so don't freak out lol. The night I finished this story was right after I just put my dog down. He was very old and got really sick out of the blue so I rushed him to the vet, but there was really nothing they could do, because it was congestive heart failure. So, I had to put him down. Needless to say I was extremely sad and bawled my eyes out. I wanted a distraction and knew this book would be it, so I decided to go ahead and escape my sadness and be with hilarious Kami, but since I was finishing the book it was only life brightening for a few chapters till the unhappy end came which just made me more depressed lol. SO the moral of my story is don't finish this book when you are sad, because you will be more sad lol. HEAD MY WARNING! It wasn't a bad ending, I definitely wasn't mad at the ending, except for that brief second because I wanted it to end in a happy go-lucky-way, but it was the perfect ending. I would not change it and now that I have coped I love the ending. I love cliffhangers and I haven't read a good one in a long time. My second favorite character was her best friend. I cannot remember her name and my galley has expired so I can't look it up, but she reminds me of myself so much. She loves food, she is always tired, hates people, and is sooo snarky and packed with saracasm and attitude. I loved her! She helped the book so much just by being herself and being unruly. I could talk for days about all the things that I loved about each character, but it would take way too long. So just take my word that they are all amazing. I couldn't find a single flaw in this book and I enjoyed every single second while reading it. I highly encourage you all to go out and buy this novel today. You will not regret it, trust me! I am utterly and completely in love with not only this book, but its author Sarah Rees Brennan. Unspoken is amazing! I have never read a book that was anything like it or even about the same topic. An imaginary friend who ends up being a real person? How amazing! And scary at the same time, I know I would be freaked out. I loved every single second of this novel, including (after coping) its huge cliffhanger ending. The characters are all amazingly well developed and I loved every single one of them. I couldn't find a single flaw with this book. I encourage everyone who loves YA to give this novel a read, and I will definitely be continuing on with this series and anything else Sarah has written! I have read so many great reviews on this book. I have absolutely got to buy it!!! The cliffhanger ending worries me a bit, but oh well, I'll probably live through it like I have the others. LOL.